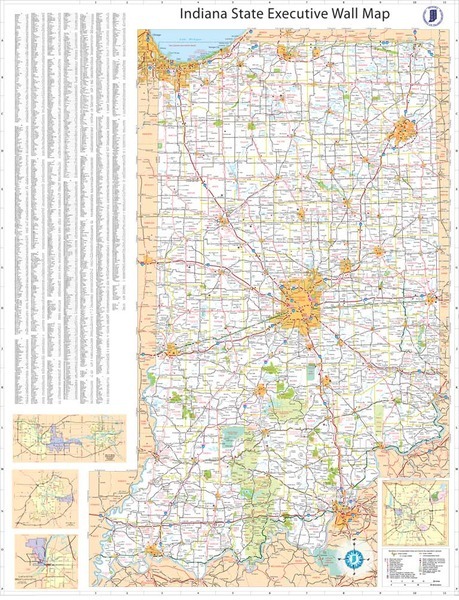 Large city, county and highway wall map of Indiana State available paper, laminated or framed in multiple sizes from 2×3 to 4×6 feet. Starting at $24.95. The Indiana Wall Map features full color mapping, lamination and full city indexing on the face of the wall map. Details all state/federal highways, cities/towns, major waterways, major airports, time zones, state universities, state parks, wildlife areas, military installations, police/state police posts, county names/boundaries, and points of interest. Major metro areas are inset in greater detail! You won’t find a more detailed wall map. 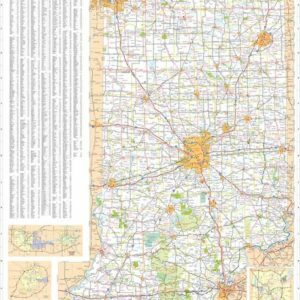 The Indiana wall map is available below in 3 different sizes to meet your needs.